An image from the book Walk With Us: East 42nd Street by Richard Holland and Emma Guest-Consales. 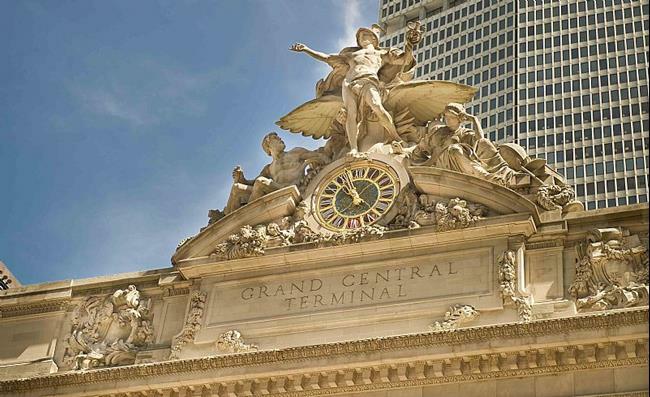 "The 42nd Street faÃ§ade is dominated by large arched windows, and the sculptural group of Mercury (Commerce), Hercules (Physical Energy), and Minerva (Intellectual Energy). The pediment is nearly 50 feet (15 meters) tall, and includes a colossal clock with a diameter of nearly 13 feet (four meters)... "